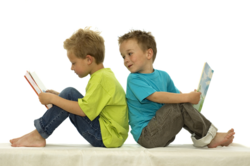 The Council for Educational Development and Research created this list of checkpoints in reading---for Kindergarten and grades 3, 6, 9, and 12---to help parents better understand their childs reading development. Not intended as an item-specific recipe for every child, this list of reading checkpoints developed by the Council for Educational Development and Research highlights some of the reading skills children develop naturally. Teachers and parents can refer to these checkpoints as general guidelines for observing, discussing, and evaluating childrens reading progress. The lists are broken down by grade level. Which grade-level checklist are you interested in reading ?